Facebook has over two billion active monthly users of different ages and with different hobbies and interests. Now you can you tap into this network and grow your reach on a channel where your customers already spend a lot of time. Over the past few months, we’ve been working closely with Facebook to create Sell on Facebook, the new Ecwid-integrated solution that is comprised of three major Facebook products: Facebook Shop, Facebook Product Catalog, and the Facebook Pixel. With Sell on Facebook, you can automatically upload (and sync) your Ecwid product catalog to the mobile-friendly Shop section on your Facebook business page and drive sales with dynamic advertising. Reach more customers — Easily add products and sell directly on your Facebook page. Mobile friendly — Seamlessly sell across mobile, tablet, and desktop devices. Effortless advertising — New pixel integration allows you to target the right prospects, and advertise to previous site visitors. In this article, we are going to explain every feature of Sell on Facebook and how it can benefit your business. Earning likes and shares on Facebook feels good. What about earning some money? With Ecwid’s Facebook Shop, you can add a Shop section to your Facebook business page. The section makes it easy for both desktop and mobile users to discover and buy your products in the familiar Facebook interface. According to our recent blog readership survey, 65.7% of SMB owners promote their products on social media, making it the most popular marketing channel among small businesses. With Facebook Shop, not only does your business page spread the word about your store — it actually generates sales. You need to be on Venture or a higher plan to use the new Sell on Facebook toolkit. Open Ecwid Control Panel → Sales channels → Sell on Facebook and click Connect Facebook business page. Then select the Facebook page where you want to add your products and click Save. Your products will be available for purchase on your Facebook page in a few minutes, depending on the size of your product catalog. To update your catalog on Facebook in the future, click Sync products on the Sell on Facebook page in your control panel. Your products can be displayed on any device. The existing Ecwid Facebook Store app doesn’t display your products on mobile devices, which is how many people use Facebook. 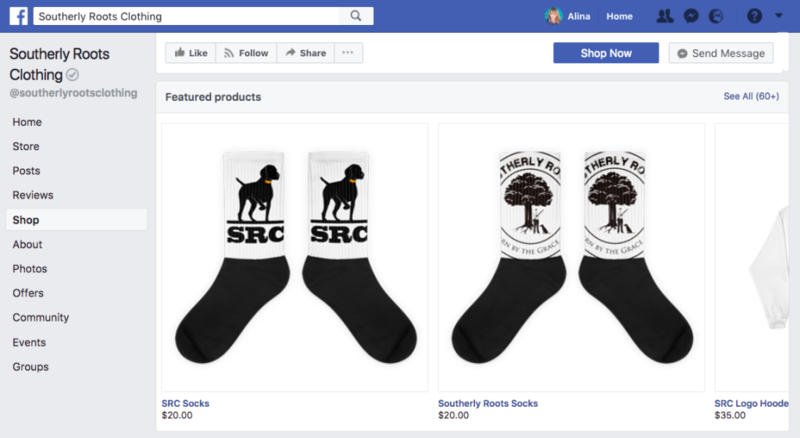 The existing Facebook Store app only adds a Shop tab to your business page, while the new Facebook Shop section appears as a larger section on your main Facebook business page, which means more people will be able to discover your products. As a bonus, the new Shop section includes a Subscribe button that notifies your followers when you add new products. The Facebook Product Catalog contains information for all of the products you’d like to advertise on Facebook, including availability, description, images, title, price, brand, and more. Product Catalog works with multiple Facebook ad types and formats, including dynamic ads and the collection ad format that is also used on Instagram and Audience Network. Dynamic ads enable you to use your product information to create engaging ads and automatically promote multiple products or your entire product catalog on Facebook, across all devices. They can be used for retargeting (following store visitors who viewed your products) or to get your products in front of new people. Effortless: they can be used to promote all of your products without you having to create individual ads for each item. On target: advertise to people who are already interested in your products and increase the probability of a purchase. Automatic: once your campaigns are set up, they run seamlessly on their own and reach your potential customers at the right time. Available on any device: your ads will reach people on any device they are using. Learn how to start advertising on Facebook with Product Catalog. It measures conversions so that you know exactly how your ads are performing. It records visitors that left your store without making a purchase so you can follow up with ads later. It helps you advertise to people similar to your existing customers. The pixel makes advertising on Facebook more effective. Not only do you know exactly who you’re advertising to, but you also have a better understanding of how your ads are performing. All in all, your ads hit the target, leading to a better return on your advertising dollars. The installation is a breeze for every Ecwid store owner, regardless of technical skills. You just need to generate your Pixel ID and add it to your Control Panel. Don’t miss the opportunity to reach billions of consumers and sell more with these great, new Ecwid-Facebook integrations. Find new business opportunities, increase your sales, and build lasting customer relationships with Sell on Facebook. Erik is Head of Program Management at Ecwid. He has spent over 20 years in e-commerce, SaaS, mobile, messaging, analytics and media. His experience ranges from startup founder to public Fortune 500 executive, including 9 years at Yahoo.